The smartphone will start shipping on Sept. 25 and arrive later this year in the U.S.
Samsung Electronics' Galaxy Note 3 has faster processors, a bigger screen with better resolution, and more RAM than its predecessor, yet it is thinner and lighter. The smartphone-and-stylus combination appeared at the IFA consumer electronics show in Berlin, the third year in a row that Samsung has unveiled a new member of its Note range there. When Samsung launched the first Note in 2011, the form factor had its detractors. But Samsung has managed to create a new product category in which it now faces stiff competition from the likes of Sony and LG Electronics. The Note's screen size has grown from 5.3 inches in the first version to 5.5 inches and now 5.7 inches on the latest Note 3, which has a 1,920 x 1,080 pixel resolution. While the screen is larger, Samsung has still managed to make the newcomer lighter than the Note II -- 168 grams versus 182.5 grams. The Note 3 is also a bit thinner at 8.3 millimeters. The capacity of the battery has increased from 3,100mAh to 3,200mAh, and there is now 3GB of RAM. The LTE version of the device is powered by a quad-core processor running at 2.3GHz, while the 3G version uses Samsung's own Exynos 5 Octa processor, which has four ARM Cortex-A15 processors running at 1.9GHz and four additional Cortex-A7 cores at 1.3 GHz. Samsung didn't elaborate on where each model will be available, but there are now over 200 commercial LTE networks whose operators will likely want the LTE model. Samsung has implemented so-called LTE Category 4, which offers theoretical peak download speeds of 150Mbps on compatible networks. The Note 3 can record 4K or Ultra HD videos at 30 frames per second (fps) using its 13-megapixel camera. This year's IFA show is expected to see a number of other new devices able to record 4K video: Acer has already announced a smartphone, the Liquid S2, with the capability. The Note 3's camera can also shoot full HD video at 60 fps, or at 120 fps for slow-motion playback. The phone also has a 2-megapixel camera on the front. Buyers can choose between 32GB or 64GB of integrated storage -- Samsung will no longer offer a 16GB version -- but there is also a MicroSD card slot for additional storage. The Note 3 runs Android 4.3, on top of which Samsung has added its own features including a user interface to take advantage of the S Pen stylus. Samsung observed that consumers didn't really use the pen, except for navigation and clicking on things, so the company has tried to make it easier to use. An S Pen function panel, called "Air Command" appears when the pen is removed from its holder and has short cuts to features such as S Finder or Pen Window. S Finder is a cross-phone search app that brings up documents, web sites, applications and even pictures. One example: type in London and the phone brings up pictures taken in London because the GPS tag identified them. Pen Window allows users to draw a box on the screen and fill it with an app such as YouTube or a browser. The box is displayed on top of other images on the screen, and can be moved around or minimized to an icon. Samsung has tried to give the phone's design an appearance of luxury. The redesigned rear cover is still plastic but has been embossed so that it appears to be leather. Fake stitching around the edge of the case adds to the illusion and it could be mistaken for the real thing on first glance. Starting Sept. 25 the smartphone will be available in more than 140 countries around the world. It will also be available in the U.S. later this year on AT&T, Sprint, T-Mobile, Verizon Wireless and U.S. Cellular, Samsung said without elaborating on more exact dates. For users that want the S Pen stylus but on a tablet, Samsung also launched the "2014 edition" of the Galaxy Note 10.1, which has 10.1-inch screen with a 2560 x 1600 pixel resolution. It has many of the same hardware and software specifications as the Note 3, including the same processors and 3GB of RAM and the S Pen improvements. 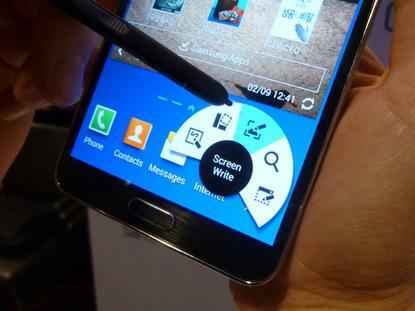 The Wi-Fi version of the Note 10.1 weighs 535 grams, is 7.9 millimeters thick and has a 8,220mAh battery. It will start shipping in September and come with three connectivity options: Wi-Fi only, Wi-Fi and 3G, or Wi-Fi and LTE.